The Stock Photo Guy - John Lund Stock Photographer: Cheetah Speed: When FAST isn't fast enough! Cheetah Speed: When FAST isn't fast enough! The ultimate speed stock photo...a rocket powered cheetah...when fast isn't fast enough! The concept of speed is an important need in the world of stock photography and you can never have too many such images. Speed images are needed for advertising and promoting everything from fast networks and Internet connections to delivery and transportation services. 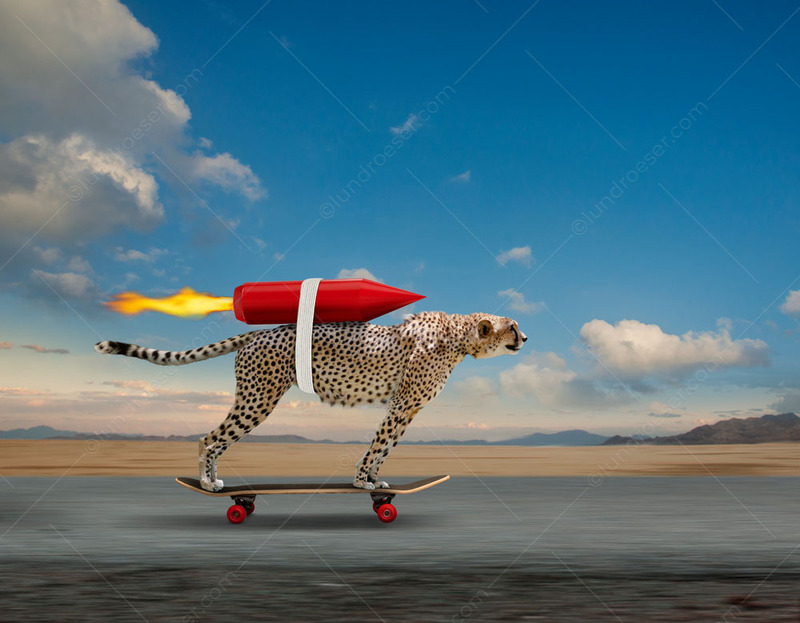 For my latest effort at creating a stock image illustrating the idea of speed I decided to start with a cheetah and give it a bit of a boost. I believe that one of the best ways to create successful stock imagery is to start with an iconic symbol and give it a new twist. When you are talking about speed the iconic symbol is that of a cheetah. Factoid: Cheetahs can hit 70 mph! That is fast! In this case I chose to add wheels and a rocket to make an already fast cat even faster. In the past I have created speed stock photos featuring a cheetah in the starting blocks, a cheetah sprinting through an office, and a cheetah riding a motorcycle. But really, a rocket-powered cheetah has to be faster than any of those…right? I started with a standing cheetah image, a desert shot (photographed at burning man…everyone should go once), a sky shot, a road photographed near my Marin County home and a skateboard and rope photographed in my studio. A piece of ducting, painted red, also shot in my studio, became the raw material for the rocket. And finally, a burst of flame, from a lighter held in front of a can of spray paint (I am NOT recommending such reckless behavior), provided the flames for the above-mentioned rocket. It was a relatively simple matter to strip out and combine the various elements in Photoshop. I added forward lean to the cheetah to make the image feel a little more dynamic…and added blur to the foreground to enhance the impression of speed. 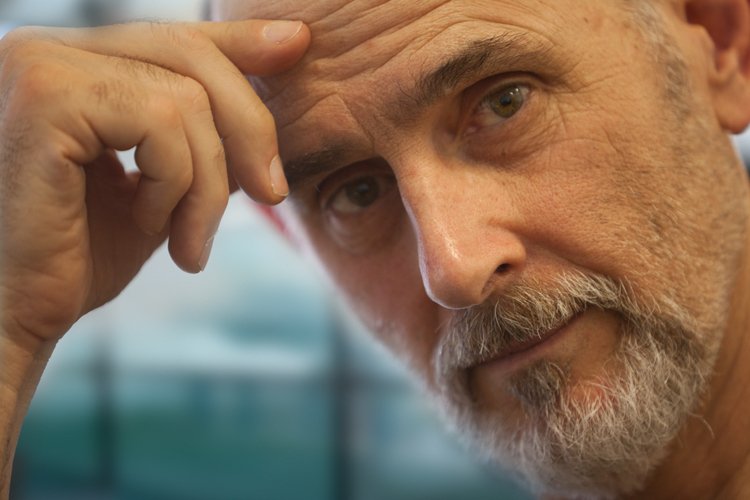 The image was composed to allow for vertical and square cropping as well as the native horizontal format…and to provide ample copy space for headlines and text. I also added just a touch of a smile to the cheetah…smiles are contagious and I want the viewer to leave with one! One other detail…I have the front wheels of the skateboard just lifting off the ground…that cat is literally taking off! The finished image of a rocket-powered cheetah is a blend between comic book and photorealism. When I finished it and sat back to ponder it the words “When fast isn’t fast enough…” came to mind…a perfect headline for a humorous stock photo illustrating the concept of speed! Choosing whether to put this image into a Rights Managed or Royalty Free pricing model was not easy. Ultimately I feel that with the amount of photography and post work going into the image it should be Rights Managed...and so it is. This image definitely leaves me with a smile…and I am hoping it leaves you with one as well!